This might not be a question we ask ourselves often enough. Gratitude is the ability to recognise and acknowledge the good things, people and places in our lives. The Harvard Medical School says that gratitude is: “…a thankful appreciation for what an individual receives, whether tangible or intangible”. The word ‘gratitude’ is derived from the Latin word gratia, which means grace, graciousness, or gratefulness (depending on the context) and is thankful appreciation. 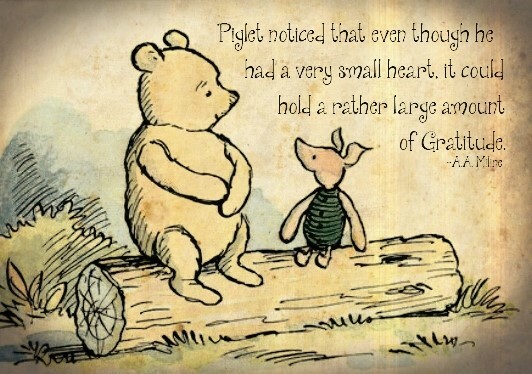 As Aesop said “Gratitude turns what we have into enough”. In our busy lives, gratitude may not be something we are aware of consciously, but from a positive psychological perspective, gratitude is strongly linked with greater happiness. Gratitude helps people experience more positive emotions, savour positive experiences and there is increasing evidence that it has a positive impact on our physical health. Yes – gratitude is POSITIVE. You may have heard of one of the gurus in the world of positive psychology, Dr Martin Seligman, from the University of Pennsylvania who said in 2018, “the single strength that correlates the most with happiness is gratitude…people need to learn and practice gratitude”. Cultivating gratitude is a skill. Many years of research indicate that gratitude is a key to psychological well-being. Gratitude can even help counteract depression. Research from Northeastern University in the USA, found that people who felt grateful for little, everyday things were more patient and better able to make sensible decisions. A study in the Journal of Theoretical Social Psychology, revealed that feeling grateful toward a partner can improve numerous aspects of relationships, including feelings of connectedness and overall satisfaction. We explicitly teach gratitude at Sha Tin College. In Year 7 GTS, for example, it is a key element of the ‘My Friends Youth’ unit because we know it can also help students feel more open, creative, and energised. Gratitude can also counter feelings of anxiety. 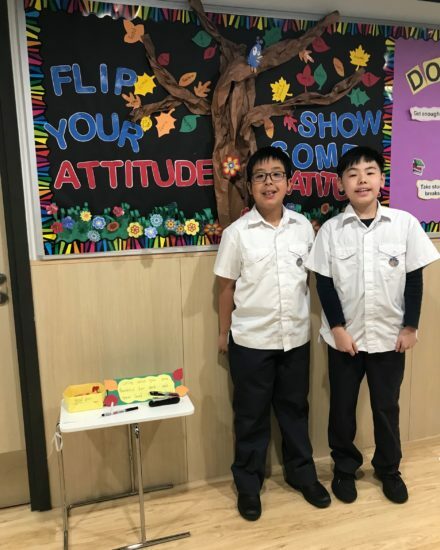 This photo of one of my Year 7s students, Anson, shows him displaying our class ‘Gratitude Diary’. 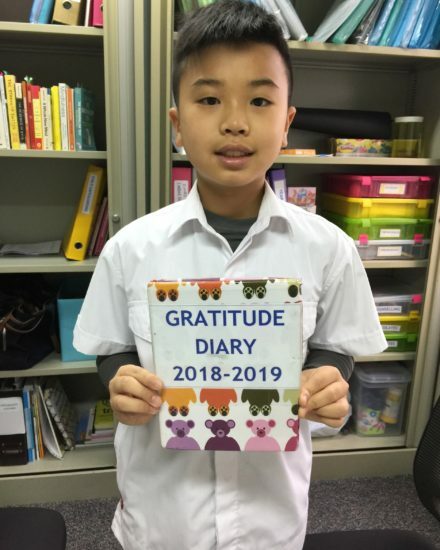 Students take it in turns to have the ‘Gratitude Diary’ for a week, during which time they write their own entry, then read it aloud to the rest of the class. This helps students focus on appreciation and valuing all the riches in their lives. I am always extremely proud of what the students include in the ‘Gratitude Diary’ because they recognise their families, teachers, friends and take a moment to reflect upon the many privileges they enjoy. 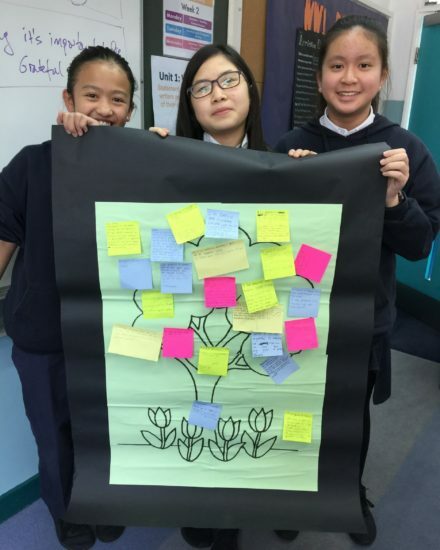 Last week, my class created a ‘Gratitude Tree’ in the lesson as Wisteria, Georgina and Helena show in this photo. This is just a simple, fun way to stop and recognise gratitude. We know that writing three things we are grateful for each night before sleep is an excellent habit to form and can result in less depression and increased levels of happiness. Feeling grateful has been linked to physical health outcomes, as well as psychological ones. For example, there are indications that gratitude may lower blood pressure and boost the functioning of the immune system. “Count blessings, not sheep”, says Emma Seppälä, a happiness researcher at Stanford and Yale Universities, and author of The Happiness Track. Research in the Journal of Psychosomatic Research also indicates that feeling grateful helps people sleep better and longer. This may be because people have more positive thoughts before falling asleep. “Gratitude is something that leads to much more sustainable forms of happiness, because it’s not based in that immediate gratification; it’s a frame of mind”, Seppälä says. Research suggests that grateful individuals might behave in ways that keep them healthier, such as not smoking and consciously eating well. All the world’s great religions espouse, teach and practice gratitude; gratitude has long been considered an important aspect of religion, playing a role in faith and spirituality. Gratitude is a way for people to appreciate what they have instead of always reaching for something new and thinking they can’t feel satisfied until every physical and material need is met. Although it may feel contrived when we first try it, this mental state grows stronger with use and practice. Writing a ‘Thank You’ message to another person to help nurture a relationship. Trying mindfulness meditation – focusing on the present moment without judgment. Expressing gratitude by doing an act of kindness such as complimenting someone’s new hair style or buying a friend a coffee. Telling the special people in our lives how they make us feel and what they mean to us. This is not being ‘mushy’ or ‘over-the-top’, just saying things like… ‘I love the way you unexpectedly bring me flowers because it makes me feel so special’. Gratitude reduces feelings of jealousy and helps us bounce back from stress. Gratitude makes us more trusting and more social. This promotes friendships and deepens our existing relationships. Gratitude stimulates two important regions in our brains: the hypothalamus, which regulates stress, and the ventral tegmental area, which has an important role in the brain’s reward system and produces feelings of pleasure. True gratitude doesn’t leave you feeling like you owe other people something — after all, if you’ve done someone a favor, you probably don’t want the person to feel like you expect something in return. It’s all about feeling good and creating a cycle of good. There are indications, in publications such as the 2015 New York Times article by Arthur C. Brooks, (author of Gross National Happiness) that “Acting grateful can actually make you grateful”. Brooks also suggests being grateful for the everyday things which can easily be overlooked. In Hong Kong these can include being grateful for living in a safe city, our incomparable transport system and the premium put on education. Being grateful for what we DON’T have, can improve our wellbeing. Remember, gratitude costs absolutely nothing. Gratitude is a selfless act. We demonstrate it unconditionally to show others they are appreciated, not because we want something in return. Gratitude can be contagious, though, in a good way. Why don’t you try it? http://gu.com/p/4dm3p?CMP=Share_AndroidApp_Gmail Could Gratitude be The Most Important Emotion of All? https://greatergood.berkeley.edu/article/item/is_gratitude_good_for_your_health Is Gratitude Good for Your Health? 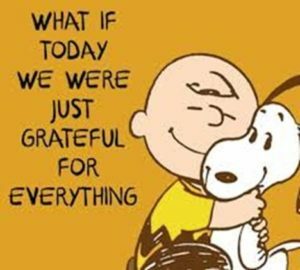 https://positivepsychologyprogram.com/gratitude-appreciation/ What is Gratitude and Why is It So Important?